Bhetki maach (Bekti fish) is one of my favorite for many reasons. Apart from it's melt in your mouth texture and a unique flavor, the fact that it has very few fish bones gets it a thumbs up from me. . I know...I know being a Bong, we are used to having fish with bones, but I feel lack of or less of fish bones does allow one to enjoy a hassle-free meal sometimes and which you can have with Bhetki maach . In Austin, Bhetki mach is not readily available apart from the frozen ones that you might get in the local Bangladeshi store. But the other day while walking through the fish section of my local Vietnamese Supermarket I saw a fish which looked like the Bhetki we know of. It was labeled as Perch. A quick help from google helped confirm my suspicion that Perch is of the same species as our Bhetki mach and I did not waste any time. I remember my mother used to cook Bhetki maach for me when I was a kid. I still remember the taste and today I made the fish exactly the same way my mother does. Yes, of course that invariable event "phone your mother for the recipe" did happen. 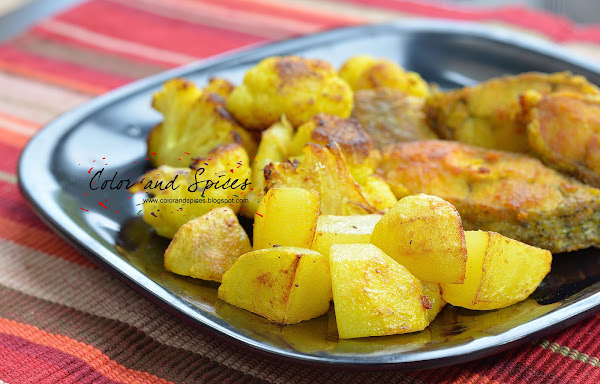 My mother used to make it during the winter with fresh cauliflowers of the season. 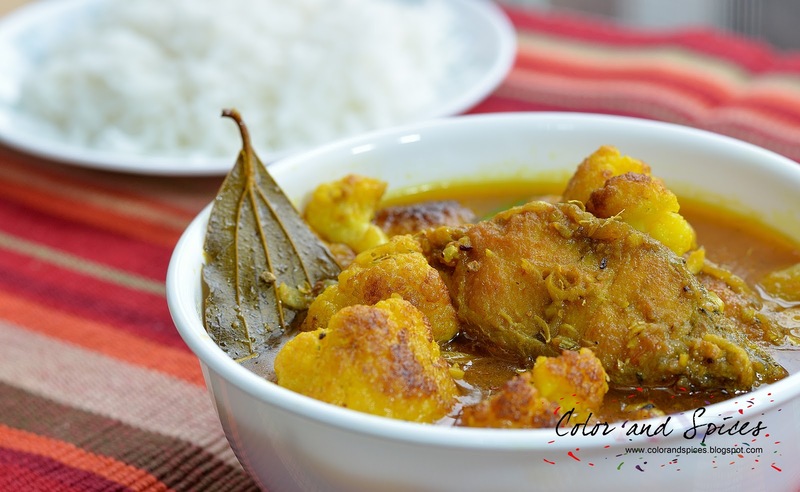 It is fish curry with potato and cauliflower. 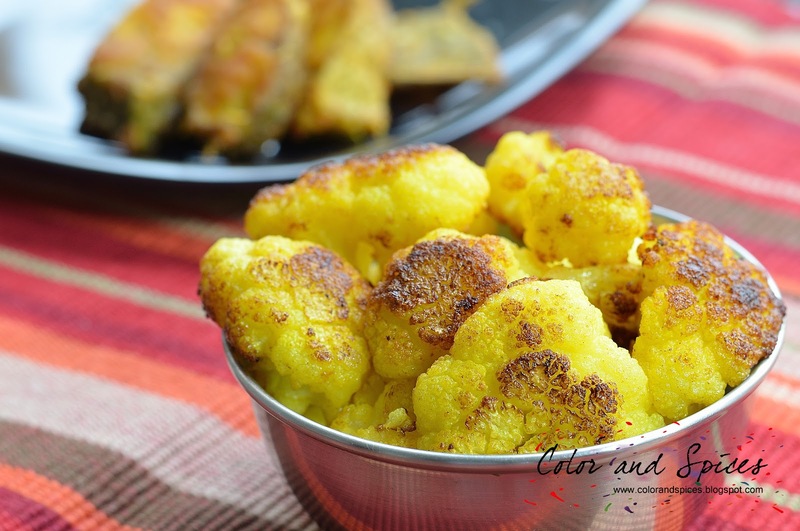 The fried cauliflower adds extra flavor and taste to the dish. If you wish you can make it without cauliflower also. 1. Clean and wash the fish. 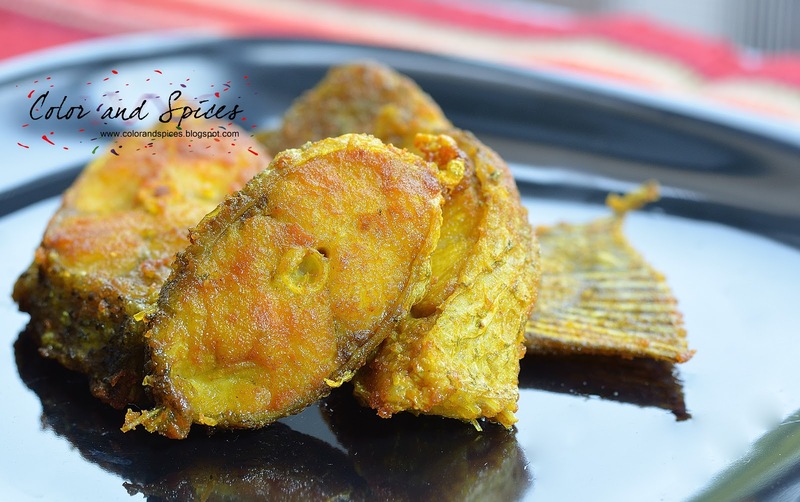 Smear salt and turmeric powder to the fish and keep it for 30 min. 2. Peel the potato and cut into large cubes. Cut cauliflower into large florets. Boil a pot full of water. As the water rolls to boil, switch off heat and add the cauliflower florets. Cover the pot and wait for 2 min. Drain out the water and wash the cauliflower with tap water. 3. In a pan or kadai, heat oil. 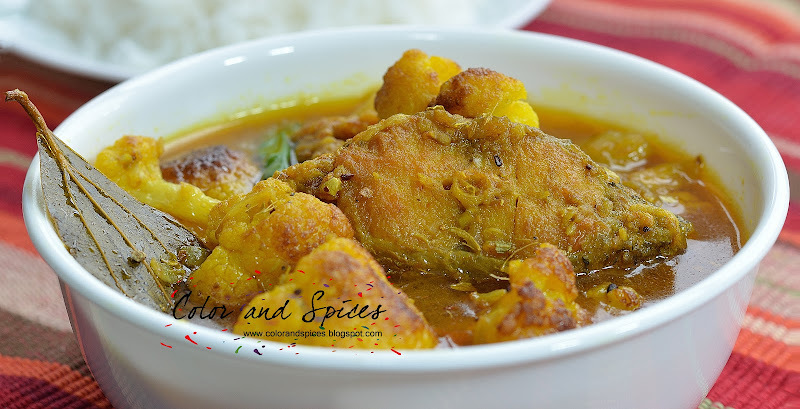 I used mustard oil to cook the dish, as it adds a nice flavor and color to the dish and also all Bengali dishes are cooked in mustard oil. You can use any other oil to cook this dish. 4. When the oil is hot fry the fish pieces to nice golden color, keep aside. In the same oil fry the potato and cauliflower to golden brown, keep aside. 5. In the same pan, add some more oil if needed, when the oil is hot add bay leaves, whole garam masala, shah jeera. Cook for 1 min. Add the grated onion and cook till it takes nice red-brown color. 6. Add ginger paste and garlic paste, cook for 2-3 min. Add chopped tomatoes. Sprinkle salt and cover the pan and cook till the tomatoes are done. 7. Add turmeric powder, red chili powder, cumin powder and cook till oil separates. Add sugar and ghee, mix well. 8. Add hot water and let it boil. Amount of water depends on the amount of gravy you want to be on the dish. As the water boils add the fried potatoes. Cover and cook for 5-6 min. Add the fried fish pieces. Cook for 3-4 min. Potatoes must be cooked by this time, add fried cauliflower. I added the cauliflower at the end to retain its crunch. Let it cook for 2 min. Check the seasoning and adjust accordingly. 9. Add garam masala powder and serve hot with steamed rice. Sudeshna, you can find them in MT supermarket. They are called perch. Last weekend I saw a big pile of those.